Embark with PONANT aboard Le Boréal for an unforgettable expedition cruise to the heart of the wonders of Arctic Alaska. 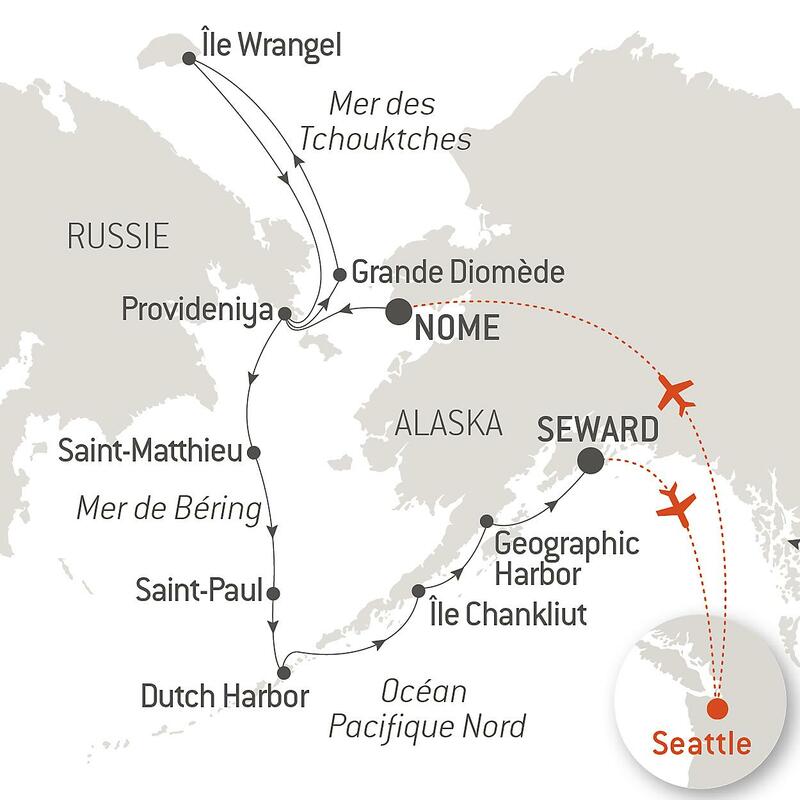 Over 15 days, from Nome to Seward, you will have the unique opportunity to sail in the Bering Strait and to discover extraordinary landscapes combining ice, volcanoes and Arctic tundra. Your ship will first make its way to Alaska’s northernmost lands. After meeting the inhabitants of Point Hope, an Inupiat community heavily marked by the history of whale hunting, you will go in search of sea ice and its myriad icy forms. Le Boréal will then head south via the Bering Strait and sail along the eastern islands of the Aleutian archipelago, an emerged part of the great Pacific Ring of Fire. You’ll then reach Kinak Bay for one of the highlights of your cruise. It is situated in the heart of the stunning Katmai National Park and Preserve and there is a strong chance you’ll be able to observe grizzlies, as they reign supreme here. The end of your journey will be marked by the discovery of the magnificent Holgate Glacier and its vertiginous slopes, before your disembarkation in Seward. A cruise amid the stunning Arctic and volcanic landscapes of Alaska. Sail in the heart of the Bering Sea, surrounded by the planet’s most remote islands. Sail in the Chukchi Sea, amid the scattered sea ice, towards the Beaufort Sea, the last icy barrier before the North Pole. Possibility of observing brown bears at Hidden Harbor, in Katmai National Park. The wildlife: polar bears, grizzlies, grey whales, sea otters, spotted seals, puffins, and seagulls. Meet the locals: the Inupiat, Aleut, Inuit, Yupik, and Chukchi people. Superior materials, discreet elegance and a tasteful décor combined with exterior and interior lines to reflect a nautical mood, subtly revisited. On board, soothing neutral tones are enlivened by splashes of red, our signature theme linking tradition and innovation to create personal touches in the spirit of a "private yacht." The world’s only French-flagged cruise line and top cruise line worldwide in polar expeditions, PONANT Cultural Cruises & Expeditions currently has five distinctive and intimate vessels, embodying the essence of a private luxury yacht: the three-masted LE PONANT, an elegant sailing yacht accommodating 64 guests and four identically designed ‘sister ships’ with no more than 264-guests LE BORÉAL, L’AUSTRAL, LE SOLÉAL and LE LYRIAL. These luxurious ships, with a fleet of 12 zodiacs and 95% staterooms with full private balconies, sail to the remote corners of the world touching all 7 continents including regions such as: Antarctica, Northern Europe & Baltics, Mediterranean, Caribbean, Central America, South America, Asia, Australia , New Zealand, South Africa & the Arctic North on cruises ranging from three to 21 nights and including many ports and islands not accessible to large cruise ships. PONANT offers a casual luxury ambience aboard ship. From Five Star Expeditions to themed cruises, the engaging itineraries offer a wealth of fascinating shore excursion programs to ensure that every voyage is a unique and exceptional experience. The latest eco-friendly technologies, attentive service, bilingual crew, luxurious staterooms and suites, an elegant, sophisticated cuisine and a chic, yet informal atmosphere offer a cruise experience unlike any other. In addition to the best available shore excursions, the 1:2 staff to guest ratio also guarantees the best in personalized service. Ships also provide a gastronomic restaurant, full service Hammam spa and fully equipped gym. Awaken Your Sense of Wonder - Explore destinations at an unhurried pace and let the beauty that surrounds you, stir your senses. No matter where you wish to travel, our cruises will take you off the beaten path to a whole new world of adventure. Welcome aboard!